style rookie: did you have a brain tumor for breakfast? What a happy Monday. I THINK YOU KNOW WHY, YOU WINTER BREAK, YOU. thrifted jacket and shoes. rodarte for target skirt. 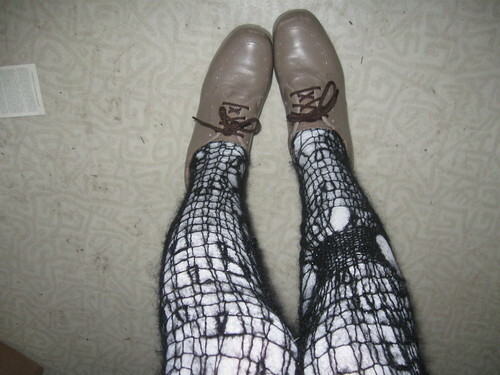 rodarte tights. 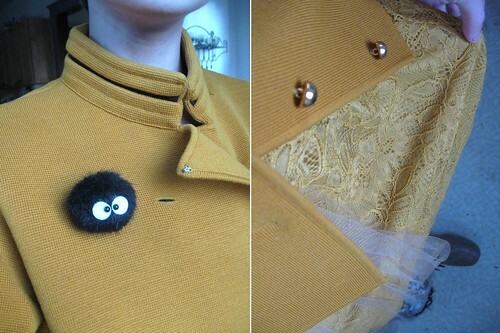 ghibli store brooch. This outfit is a few days old. Wanted to go for some weird, put-together but creepy vibe...I dunno, didn't really work but it was comfy and such. 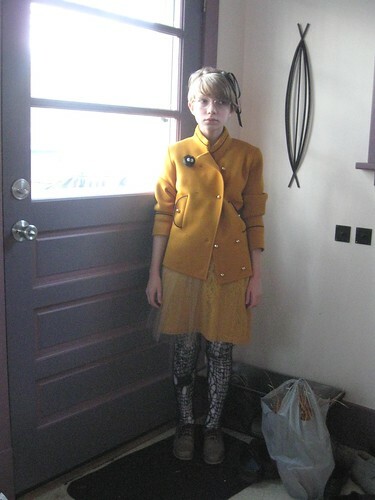 I got this little jacket number at the Salvation Army a couple weeks ago and had in mind the mustard skirt from the Rodarte for Target collection. SPEAKING OF, who went yesterday? Was it nuts? Whadja get? Super curious. SPEAKING OF SPEAKING OF, thank you to everyone who entered the contest. 838 entries so I'm not sure when I'll announce the winner but just stay tuned and keep checking your email. I'm really glad and already tired to see there are so many four-paragraph thesis essays on why some people love Rodarte, haha. So I'll get back to yous alls soon. So back to this outfit, the jacket has elevendy squillion (copyright Sheba) buttons and I fully intend to look as though I am constantly keeling over whenever I wear it, thank you very much. Oh ps, anyone have a guess as to when it's from? I'm no vintage expert but I am curious. Oh and the tag is so cute, it says Saks Fifth Avenue (fancy!) and is all old-looking and such. Skirt is lovely, I am a fan of how half of it has the tulle pleats. I love two-tone schizo stuff and I love tullllleeee. And because of the new law, I am supposed to let you know that I received compensation and pieces from the Rodarte for Target collection for my collaboration with Target. AHHHHH sooo cute I can't take it. I want a giant Totoro that takes up my whole living room. I loved my Disney princesses when I was a toddler but I loved Totoro more...it was more accessible, if that makes sense? And it made ghosts not scary. I am friends with ghosts, spirits, and orbs. Ella and I did the Ouija board the other night and it was scary as hale but nice to me. It's been about a year now since Kate and Laura first emailed me...AND THE REST, AS THEY SAY, IS HISTORY. No but really, so weird to think about!! When I'm a batty old woman with furniture stacked up in my yard and lights strung through the trees, these tights they gave me will still be of my most special possessions. Oh, I watched Heathers last night. So great. When Spring comes I will take a picture in plaids and a monocle and my head sticking out of the ground on a lawn.